Yay! The bathroom is finished! Mostly. I still need to paint the crown molding and touch up the cabinets here and there, and I need new towels and a bathmat. But that hardly counts, right? Oh, and I still have one box of stuff I need to figure out how to get back in the cabinet/drawer. The best part of doing this was finally having to purge the junk I'd been stuffing into drawers and cabinets for the last ten years. Bye bye, Crabby Bow. You were fun but I'm sending you to the farm to play with other crabby bows. 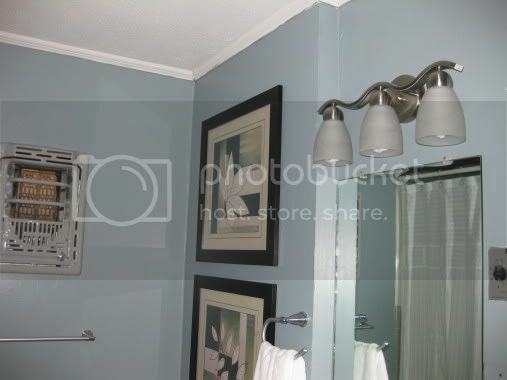 No more toilet-seat towel ring. 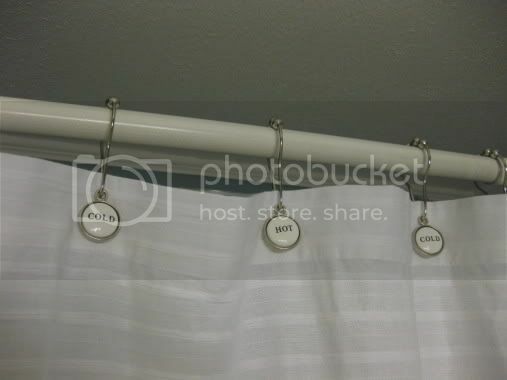 Is it pathetic how excited I am about my new shower curtain rings? I found them completely by accident and bought them even though I'd already bought new rings (which are now on their way to Goodwill). At least they were on sale, right? Right? The hardest part was finding hooks. 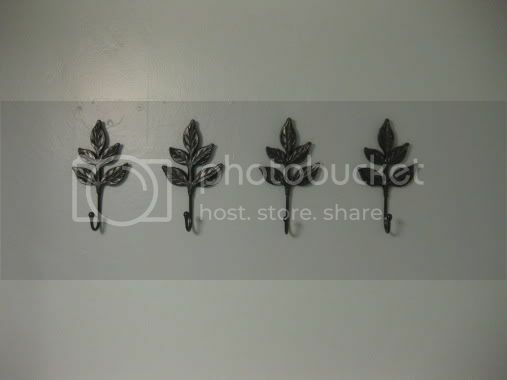 The nice lady at the hardware store where I found the shower curtain rings suggested Hobby Lobby, and she was right! And they were on sale, too! I had to paint them, because they were a weird yellowish green/brown. I found these by accident on Christmas Eve, trying to buy Christmas crackers at Cost Plus (they were sold out :( which made me sad). 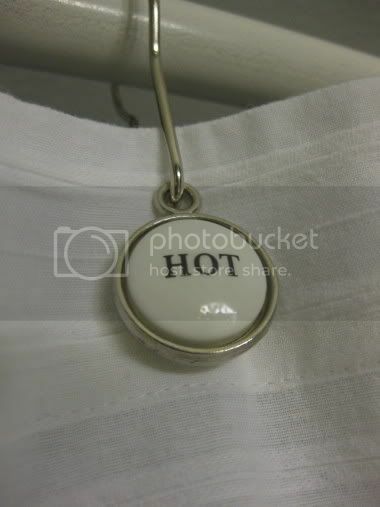 But then I ran across these and they were - you guessed it - on sale! 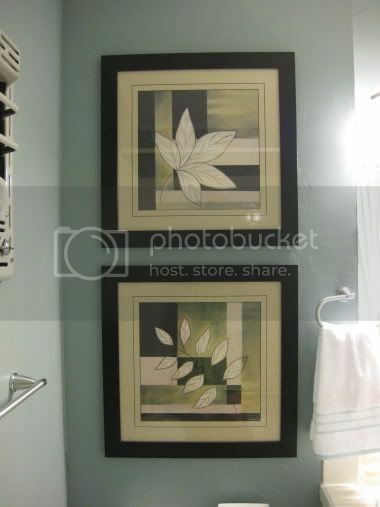 I think "on sale" is the theme of this bathroom. 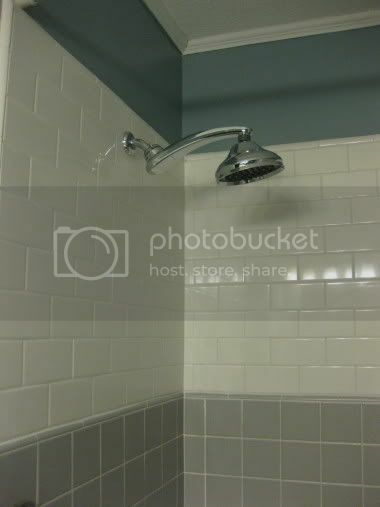 What started it all - we needed a shower in here. My sister added the white subway tile above the existing tile and my BIL plumbed and installed the shower head. This picture is probably not all that thrilling for you, but I am very excited about my new sink. 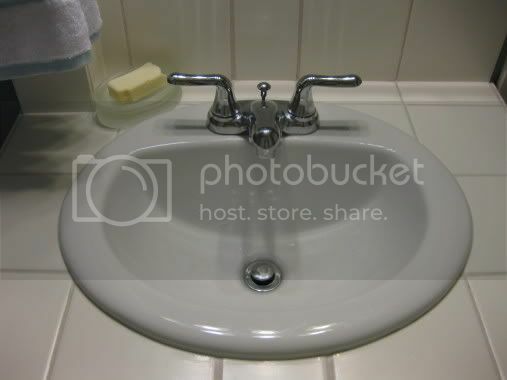 And faucet. And actual backsplash. 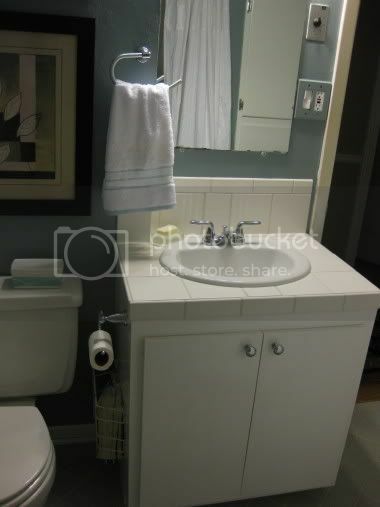 And of course, once one thing got painted, everything needed painting, so the vanity got some sprucing up. And the baseboards, which had unpainted quarter round. I'm so fancy, I even got a toilet paper holder to match the new towel ring. 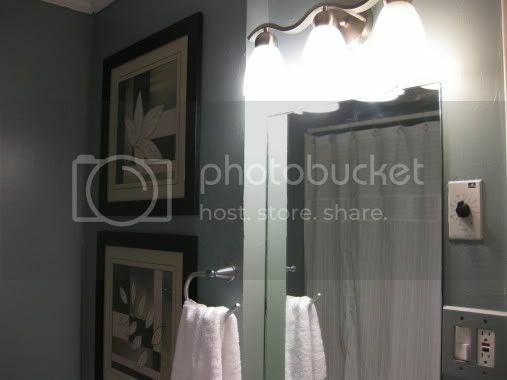 And finally, a better picture of the light fixture. I love the color you painted it. It looks great!